Bosnia and Herzegovina (BiH) is an upper middle-income country, which has made good progress in terms of its development since the end of the Bosnian War in the mid-1990s. Its complex political system reflects the constitutional provisions made by the Dayton Agreement (to end the ethnic conflict), as well as the subsequent amendments introduced under the auspices of the international community through the Office of the High Representative. Today, BiH is an European Union (EU) potential candidate country that is embarking on a new growth model. Bosnia and Herzegovina held both presidential and parliamentary elections on October 7. BiH is not yet a member of the WTO. The Working Party was established on July 15, 1999, when the country started its accession negotiations for the WTO. In February 2018, the 13th meeting of the Working Party on the Accession of BiH was held, where WTO members supported the prompt conclusion of negotiations and welcomed the commitment by Sarajevo to finalise its accession process over the course of 2018. The standard VAT rate is 17%, and the VAT regime applies equally throughout the country of Bosnia and Herzegovina. There is no reduced VAT rate in Bosnia and Herzegovina. The export of goods is zero-rated. The customs policy law and the rates of customs tariffs to be applied exist and are largely based on EU standards. BiH has signed the Stabilisation and Association Agreement (SAA) and the Central European Free Trade Agreement (CEFTA). In 2009, BiH introduced a law for the protection of domestic products against imports from Croatia and Serbia. 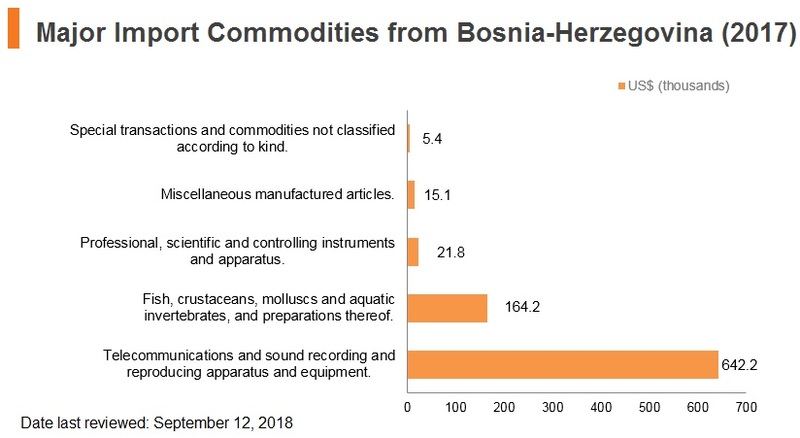 The law stipulates that safeguard measures were necessary due to the influx of imports and dumping of particular agricultural products from Croatia and Serbia, as well as a conceivable decrease in exports from BiH to Serbia. 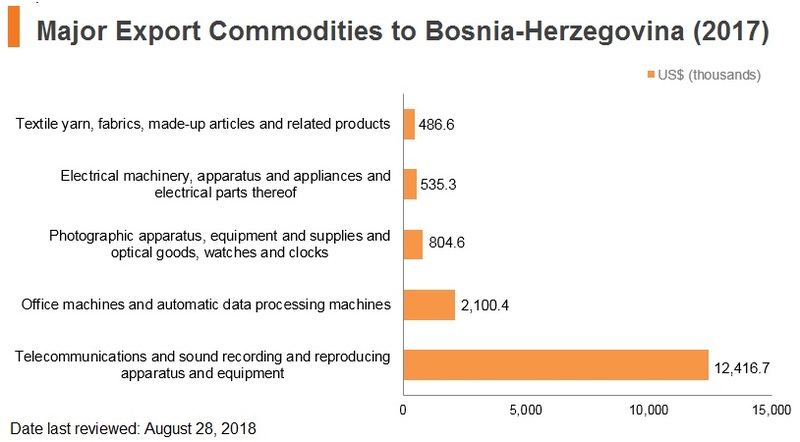 As a result of BiH not having EU member status, even though the majority of its trading partners are EU member states, export and import supply chains will face more onerous border and documentary times and costs when compared to those of EU states. 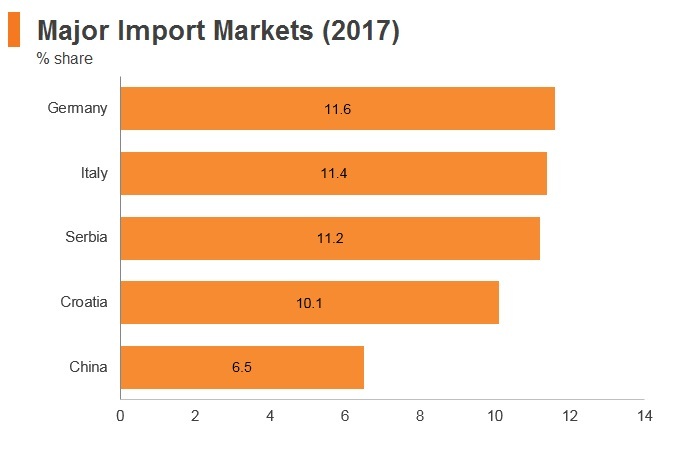 The most salient risk is the high cost associated with the import border compliance process, which is higher than that of countries such as the Former Yugoslav Republic of Macedonia, and contributes towards BiH's status as regional under-performer in relation to customs burdens. An agreement which will allow the export of honey, milk and dairy products from BiH to China is expected to be signed in July 2018, at the next summit of the 16+1 grouping. 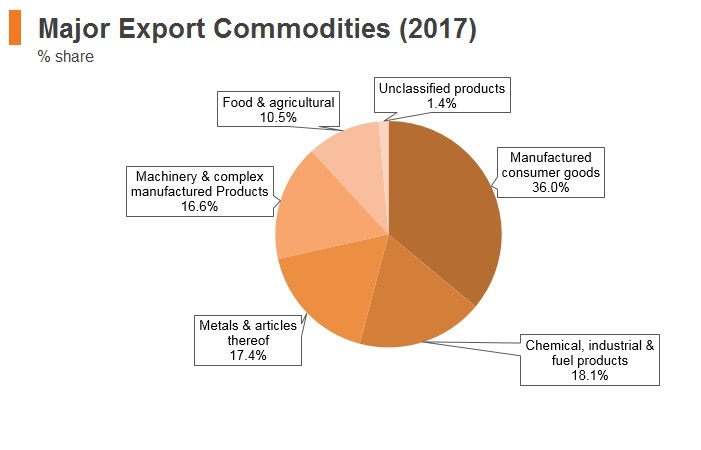 However, before gaining access to the Chinese market, Bosnian exporters will have to meet certain criteria, such as having adequate health and sanitary standards. 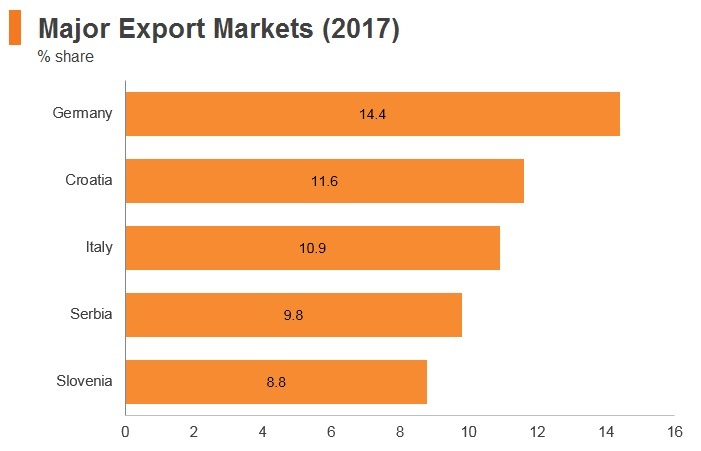 BiH and European Free Trade Association (EFTA), consisting of Switzerland, Norway, Iceland and Liechtenstein: The main focus of the EFTA-BiH Free Trade Agreement (FTA), which came into force in January 2015, is on the liberalisation of trade in goods. EFTA and BiH abolished all customs duties on industrial products as of the entry into force of the Agreement. Additional agricultural agreements between the individual EFTA States and BiH form an integral part of the instruments establishing the free trade area. 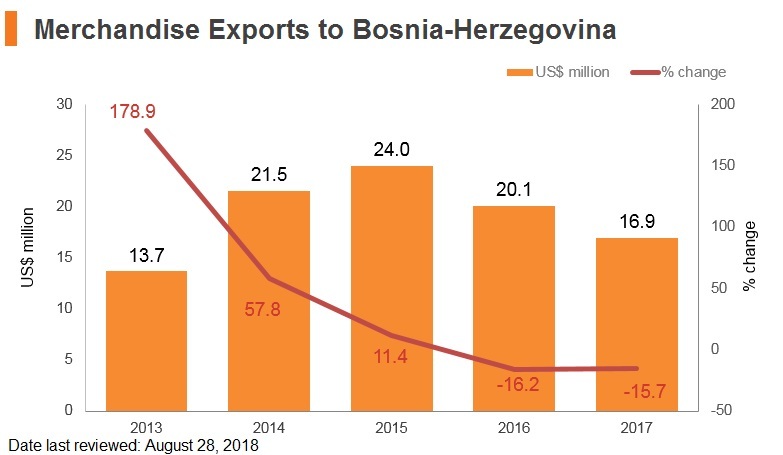 EU and BiH: The SAA between the EU and BiH entered into force on June 1, 2015 and has caused a shift in the latter's export and import partners and goods. The SAA establishes a close partnership between the EU and BiH and deepens the political, economic and trade ties between the two parties. It is from now on the main framework for the relations between the EU and BiH, further preparing the latter for future EU membership. The entry into force of the SAA has also increased the confidence of domestic and international investors in BiH. It allows both Bosnian and EU companies to access their respective markets. This is conducive to enhanced business opportunities for both the EU and Bosnian based companies, and would stimulate economic growth and employment. SAA will also contribute to the progressive alignment of Bosnian norms and legislation with the EU legislation, thus benefiting Bosnian citizens through better quality, healthier and safer goods. Turkey-BiH: An FTA with Turkey, which came into force in July 2003, provides additional free access to a consumer market of 80 million people. 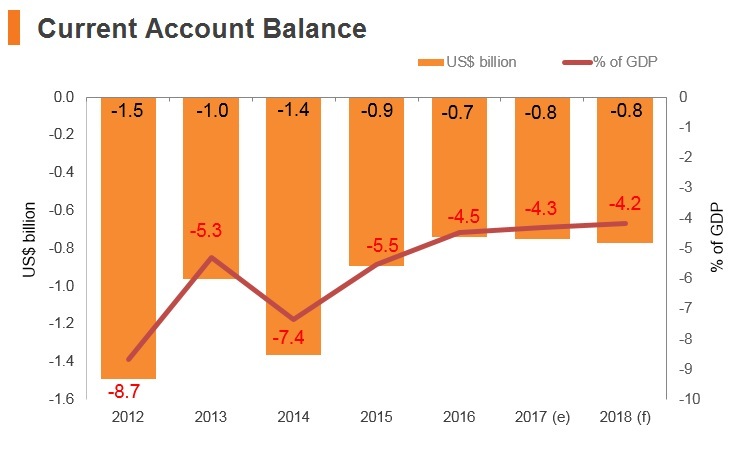 Malaysia-BiH: The agreement, which is expected to materialize by 2020, will help businesses exploit opportunities in manufacturing and the import and export of Halal products due to the large population of Muslim consumers in both markets. This will also boost service exports in terms of tourism in both countries. The Foreign Investment Promotion Agency (FIPA) of BiH works to attract Foreign Direct Investment (FDI), and encourage existing investors to expand their businesses in BiH. 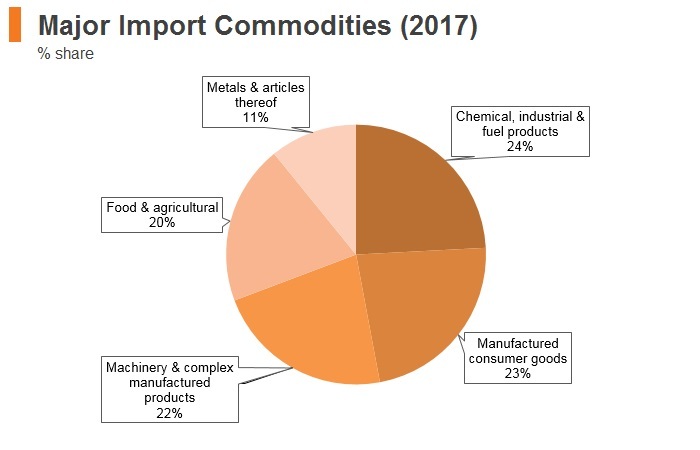 FIPA has identified sectors, such as manufacturing, energy and wood processing as key industries that are likely to see high investment growth in the coming years. 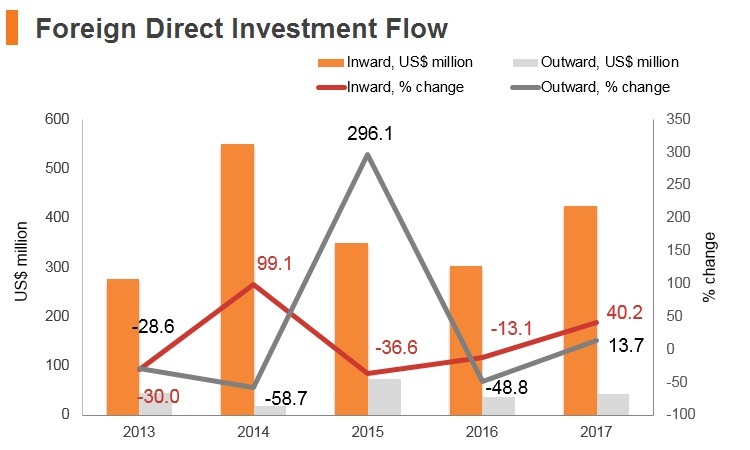 Overall, there are no restrictions on foreign investment or ownership, with the exception of the defence and media sectors, where foreign control is capped at 49%. 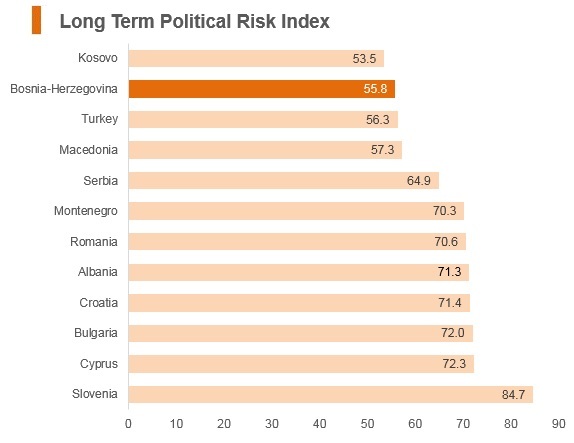 Despite the various investment incentives of the Bosnian market, some short-term risks as well as longer term barriers to FDI still exist. 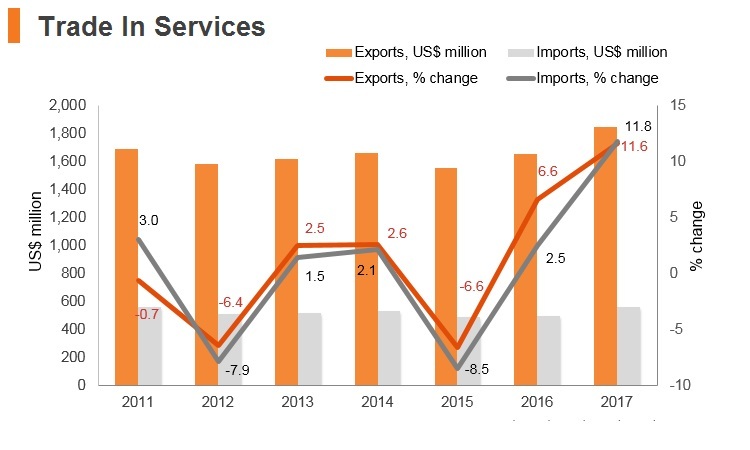 State-owned enterprises (SOEs), which affect sectors such as defence, media and telecommunications, are mostly owned by the sub-national governments and are thus controlled by various political parties, which leaves them open to corruption and inefficient management. By law, private enterprises can compete under the same conditions as public ones, but in practice SOEs have the upper hand as some of them hold a near-monopoly and make large profits due to their dominant market position. Although Bosnian law states that foreign investors shall have the same ownership rights of real estate as domestic persons, the Law on Agricultural Land prohibits foreigners from acquiring ownership of agricultural land unless international agreements state otherwise. The rights of foreigners to acquire respective ownership over real estate in BiH may also be subject to reciprocity. This may present risks to investors, or simply dissuade them from investing or seeking ownership of property in the country. 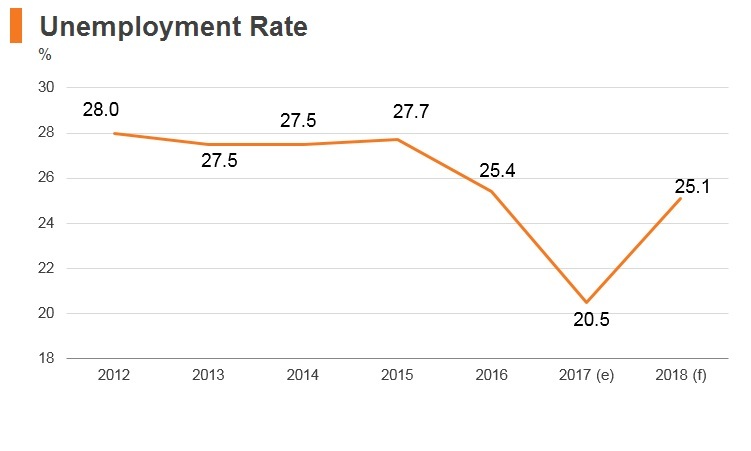 BiH exhibits the fifth-worst state of cluster development in the region (out of 12 South East European states), behind Romania. 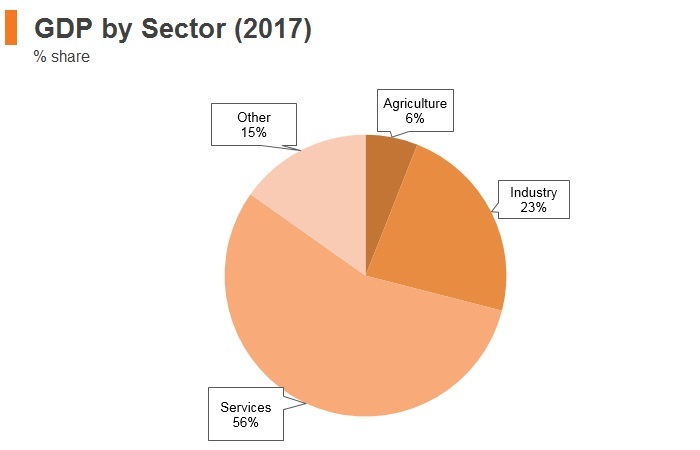 This indicates that there are few business parks with close groupings of ventures from multiple different sectors, suggesting a poor state of business relationships and economic management in the country. BiH operates a number of Free Trade Zones (FTZs) which offer a range of incentives for investment. 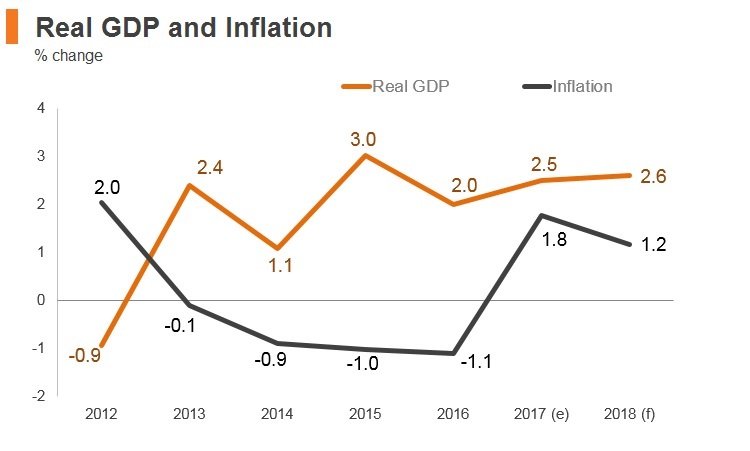 No substantial corporate tax developments occurred in Bosnia and Herzegovina over the last fiscal year. The anticipated new Personal Income Tax Law in the Federation of BiH and the adjustments to the Law on VAT are still subject to parliamentary proceedings. The new Law on Contributions in the Federation of BiH that should follow the anticipated changes in taxation of individuals, is still being negotiated by stakeholders. Non-resident businesses (whereby actual management and supervision is based outside the FBiH), which pay taxes on income realised in the FBiH only. Simultaneously, in the Republika Srpska and the District of Brčko, the corporate income tax law does not distinguish according to residency definitions, but whether a business is incorporated in the area or merely a branch in the entity, thus paying only taxes on income realised in the territory. 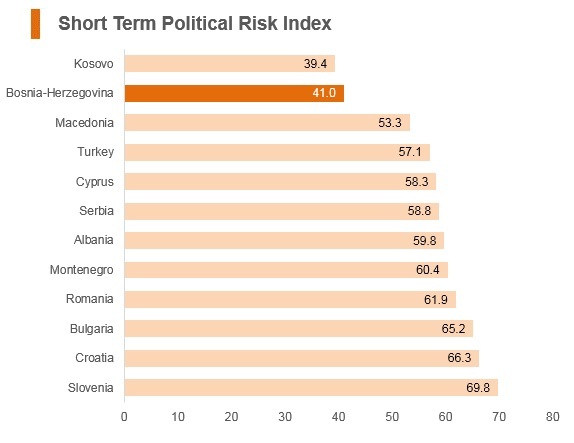 However, generally taxes in Bosnia and Herzegovina are rather low, with a 10% statutory tax rate on operating profits. Dividends paid to non-resident companies are taxed at 5% in the FBiH and 10% in the Republika Srpska and District of Brčko, while dividends received can generally not be taxed in any entity. Interest as well as patent royalties and copyright royalties paid to non-resident companies in all entities is taxed at 10%. 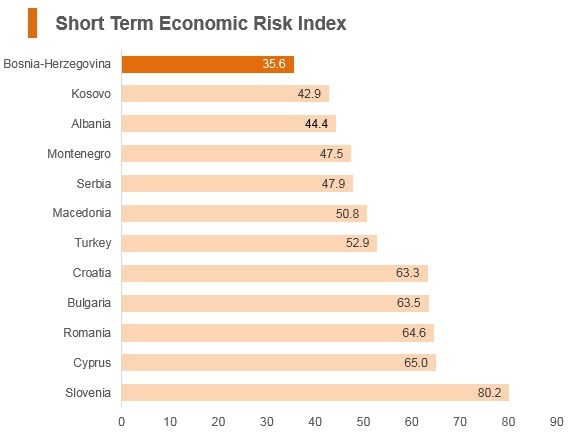 Since unemployment in BiH is high, requirements for businesses to hire foreign workers are rigorous. Quotas on the number of work permits which may be issued to foreign workers for each sector of the economy are decided on an annual basis by the Council of Ministers. Only the highest level educational degrees are accepted as legitimate reason to hire a foreigner instead of a local. The permit application process is lengthy, with 45-50 days required for a work permit and 30 days for a residence permit. Work permits are valid for a period up to one year, and are only valid for the specific job and specific employer for which they are originally issued. 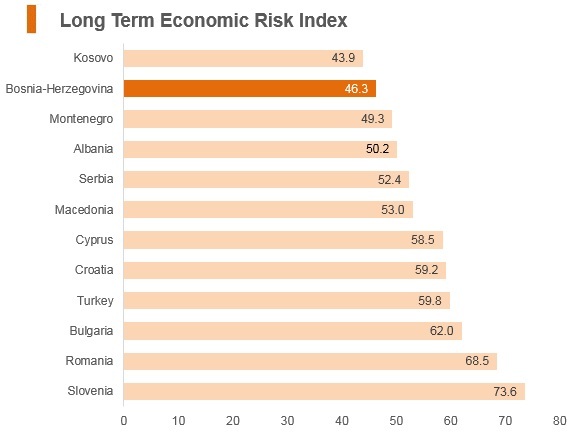 The risks associated with such rigorous demands and lengthy visa processes will deter businesses requiring highly skilled workers from locating to BiH, as the low skill level of the domestic labour force means that foreign labour will often be required. 30 days are required for a visa application and citizens of all African, some Latin American and most Asian and Middle Eastern states require a visa before arrival. Due to various visa arrangements, foreign nationals from 79 jurisdictions that include Europe (except Belarus), North America, Australia, New Zealand and some parts of Latin America enjoy access into BiH without a visa for up to 90 days. 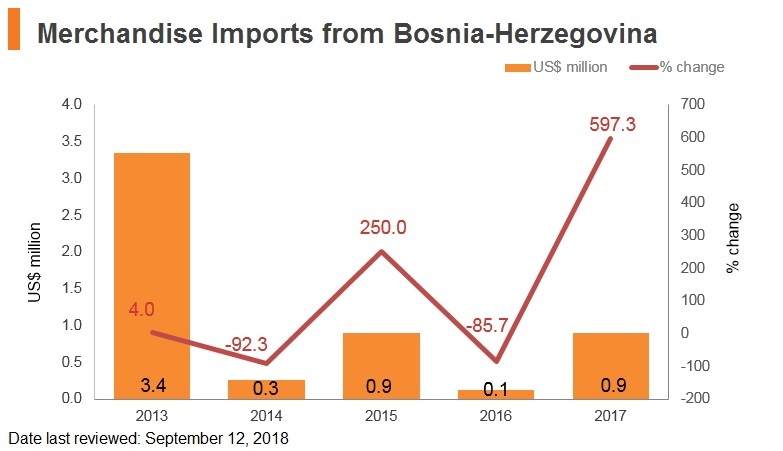 BiH offers an operating environment with significant operational risks, mainly relating to weak transport infrastructure, the limited size of the labour force, a fractured political environment and weak cross border relationships. 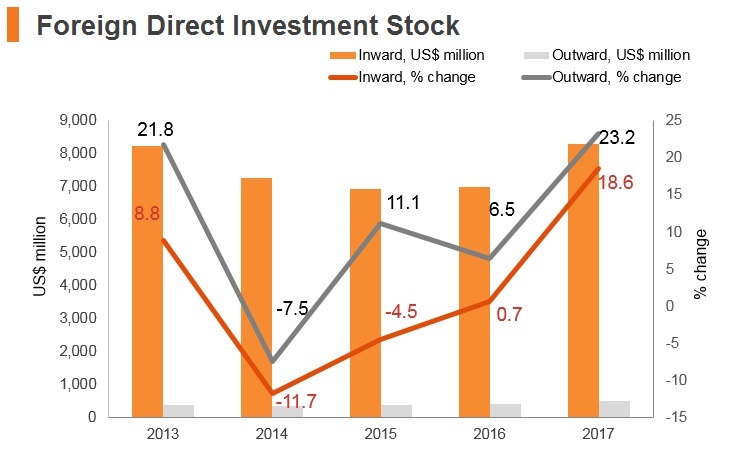 Even though the country has a relatively open investment climate, with no restrictions on foreign direct investment and a low rate of corporate income tax, its small market size, complicated regulatory barriers and weak rule of law weigh down investor confidence. The Agreement between the People's Republic of China (PRC) and BiH on the Promotion and Protection of Investments entered into force in January 2005. 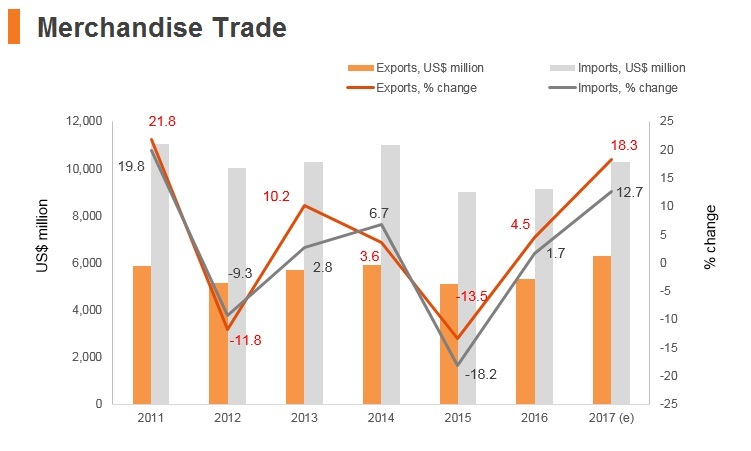 The duration of the initial treaty term is 10 years, with its purpose being to extend and intensify the economic cooperation between the two countries. The Agreement on the abolition of visa requirements for holders of ordinary passports between BiH and PRC was signed by the two countries in November 2017. The agreement stipulates that citizens of BiH and the PRC, who are holders of valid passports, will have no obligation to obtain visas for entry, exit, stay or transit through the territory of the other contracting party up to 90 days within 180 days. The Agreement on agricultural cooperation between BiH and PRC was signed in November 2017. The signing of this agreement is opening the process of intensive communication between institutions and business communities in the field of agriculture and rural development in both countries, as well as providing further promotion of economic, scientific and technological cooperation in the aforementioned sectors. BiH has a Double Taxation Agreement (DTA) with PRC, which entered into force in December 1989. A tourist visa is not required for citizens of Hong Kong for a stay up to 90 days. All travelers will need a passport valid for at least 90 days from the date of first entry into the territory of BiH.